Another reason to drive a "bus" into work. Taken in Whitehall on the way home last night. Submitted by montreal on Wed, 24/06/2015 - 22:56. Did you ask him if what engine was fitted. These were fitted with various petrol and the 617 turbo diesel at some stage. I had a huge model of it when I was about 5. The memory and the love of Mercs has stuck with me ever since. So cool. Submitted by alastair.purcell on Fri, 03/07/2015 - 16:44. Looks like it might have been this one with the rotary engine. Submitted by alastair.purcell on Wed, 17/06/2015 - 15:15. I'd like to say [a] or maybe even [b] - but the truth is [c]. a] I've fitted a Beta version of the TATA remote drive. Enabling me to race the old diesel car next to me from the lights while watching the action from the sidelines. b] No remote drive. 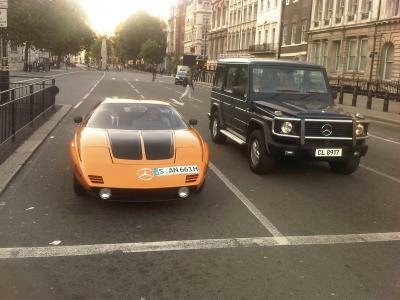 But we were both on out way to the press launch for Chris Evans taking over Top Gear. c] At the lights on my way home when I looked at the car that had pulled up next to me......... and thought, "I can't miss that chance. It must be illegal to abandon a vehicle just outside Parliament, but nobody with a heart would fine me." Submitted by Spider1V on Wed, 17/06/2015 - 09:56. Submitted by markhowes on Wed, 17/06/2015 - 11:28. Do you mean you haven't got one of these? Submitted by IanA2 on Wed, 17/06/2015 - 09:59. There are two clues Spider. Submitted by Roly on Wed, 17/06/2015 - 08:05. Submitted by Arnie on Wed, 17/06/2015 - 07:04.